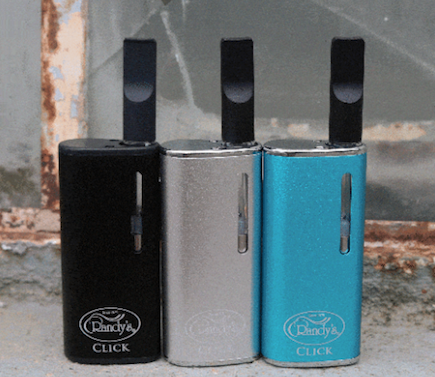 Equipped with a 10-second vaporizing cycle that runs at 4.2V, the 650mAh Battery of the Click pumps out 8W and gets the Click to a Max Temp. of 400° F. The 1.0 ml Click CE3 Tank comes equipped with Anti-Spit Back Technology and the top fill tank makes for easy access. The Click comes with two magnetic adapters to connect to the CE3 tank or your own personal pre-filled tank. The magnetic adapter allows for easy transitioning between tanks, just place your tank inside the allotted slot and listen for the ‘click’. Once Clicked into place you are all set to enjoy all your favorite oils! Note: I think the best things about the Click are the option to use your own 5/10 threaded cartridge as well as the way the cartridge sits inside the casing.